An international research team, including Surhud More and Anupreeta More from Inter-University Centre for Astronomy and Astrophysics (IUCAA), Pune, has ruled out the possibility of primordial black holes being a major constituent of Dark matter. This finding disproves a theoretical claim of Professor Stephen Hawking. In the solar system, Mercury, the planet closest to the Sun, takes just 88 days to make one revolution around the sun; while Neptune, the farthest one, takes 165 years to make one round. Laws of gravity expect us to see stars closer to the centre of galaxies rotating faster than the stars on the edge. However, in most galaxies, the stars closer to the centre and the stars at the edge of the galaxies take almost same time to make one revolution. This implied that something invisible and enveloping the galaxies was giving an extra push to the outer stars, speeding them up. This entity, known as `dark matter’, has remained as one of the central unresolved puzzles in cosmology since 1930s. Detailed surveys of the cosmos indicate that almost 85 per cent of the total mass of the Universe is composed of dark matter. Thus, stars, galaxies, and atoms that we see all around are just the tip of the iceberg, and the elusive dark matter makes up the bulk of the Universe. Cosmologists have come up with various hypothesis and theories to explain the dark matter. Some postulate it to be composed of neutrinos — particles that have no charge but have tiny mass and, therefore, do not interact with the electromagnetic spectrum, but are interacting gravitationally. Others have postulated they may be some new kind of elementary particles — “weakly-interacting massive particles (WIMPs)”, or “gravitationally-interacting massive particles (GIMPs)”, which are yet to be detected. When the big bang hypothesis was proposed, two Soviet physicists, Yakov Borisovich Zel'dovich and Igor Dmitriyevich Novikov, proposed that at the initial instant of the big bang, the densities would have been very high at many points, resulting in the formation of small black holes. These were named “primordial black holes”. 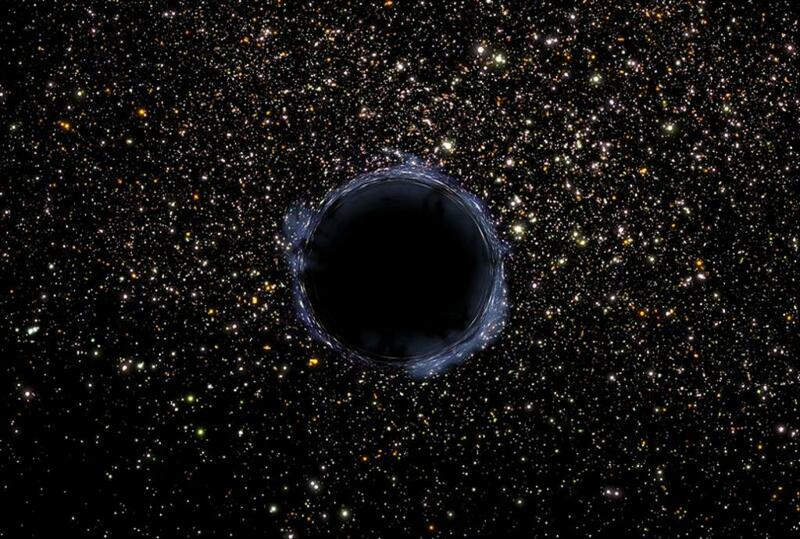 Black holes are not radiant and will not be visible through any telescope. However, as first suggested by Albert Einstein, if by chance, a tiny primordial black hole eclipses a distant star, light rays of the star will bend around the black hole due to the gravitational force, resulting in the star appearing to be brighter than it originally is for a short while. Called “gravitational lensing”, this rare phenomena can occur only when the star, the black hole and the observer on the Earth are aligned in a straight line. The research team — which was led by Masahiro Takada, Hiroko Niikura and Naoki Yasuda from Kavli Institute of Physics and Mathematics of the Universe — used the Hyper Suprime-Cam on the Japanese Subaru Telescope located in Hawaii to look for any tell-tale evidence of primordial black holes between Earth and Andromeda galaxy using gravitational lensing technique. It would be absurd — like searching for a needle in haystack, if we keep looking at one star and hope some time or other an invisible primordial black hole will eclipse it. The research team, consequently, kept observing the entire disk of the Andromeda galaxy consisting of lakhs of stars. Now, there is a chance for some primordial black holes, if they do exist in sufficient numbers, eclipsing any of these stars. “The investigation is delicate and tricky. The eclipsed star may brighten up for a period of a few minutes or a few hours due to gravitational lensing, requiring the team to take multiple images to catch the flicker, if any,” says Anupreeta More. For a whole night, the research team took 190 consecutive images of Andromeda galaxy. “If the Universe is filled with invisible teeny weeny primordial black holes — with masses lighter than the moon, as postulated by Stephen Hawking — then we should have seen at least 1,000 gravitational lensing events. We saw at most one such candidate event, if not none. This implies that Hawking’s theory, of such black holes making up all of dark matter, is wrong,” adds More. “Previous studies had already ruled out the existence of large numbers of primordial black holes that could range in size from the mass of the Moon to about 10 solar masses. The present study rules out the presence of primordial black holes with masses comparable to the moon and sizes of about 0.1 millimetre too. This implies that at best the lunar mass primordial black holes can contribute 0.1 per cent of all dark matter mass,” says Surhud More. Did the Cow lead scientists to birth of a black hole?